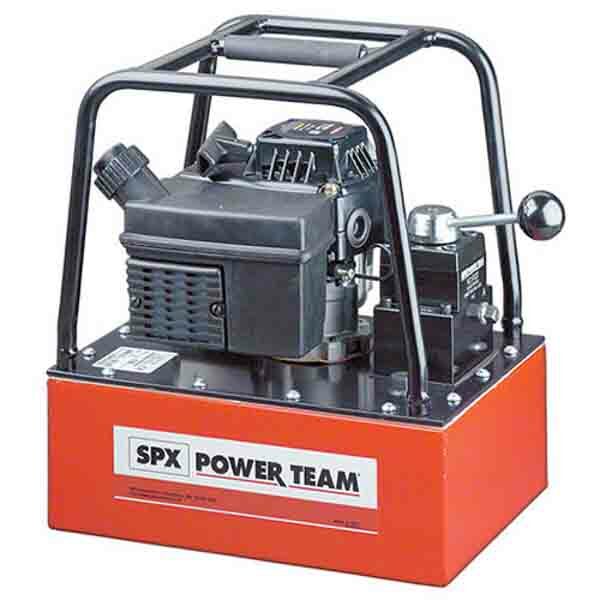 Petrol/hydraulic pumps deliver between 0.5 and 0.9 litres of oil per minute and operate single- or double-acting cylinders up to 700 bar. They are designed for remote locations where there is no readily available supply of compressed air or electricity. “Posi-Check” valve ensures that no pressure is lost when the valve is shifted from “advance” to “hold”. The PG30 Series is applicable for struts up to 75 ton cylinders; for higher tonnage cylinders, up to 150 tons, the PG55 is the series to use. When the pump is running, the internal return line valve enables the oil to return to the reservoir separately of cylinder return oil, when the valve is in the “return” position. ** Usable oil is calculated with oil fill at recommended level at 13 mm below cover plate.